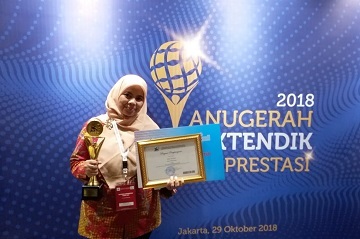 Heni Taryani, financial manager at the Directorate General Competencies Education Program (PPKU) succeeded in selecting the name IPB Personnel Berprestasi 2018 held by Kemenristekdikti in Jakarta on October 28 to 30. Through the various stages of the selection of IPB, Heni Taryani selected as the winner representing the IPB in national level. The national selection is done by submitting a portfolio and innovation of the participants were then chosen to be the top ten finalists. "Selection starts from the stage of IPB, then selected one winner to represent IPB at the national level. At the national level, we (participants) send a complete portfolio with innovation, then selected the ten finalists and invited to Jakarta ". Heni said Taryani. Boarding Facility Management Information System (Simara) is an innovation that brought Heni Taryani. Simara basic formation is a reporting system dorm damage. Simara features the financial and academic administration system whereby academic administration system can be adopted by other units on the licensing and correspondence. Simara This is a new innovation which will be launched on mingu to eight right after the Middle Semester Exam (UTS). The system will be launched this is something that is innovative as well as web-based and android. M ahasiswa IPB can get this application through PlayStore IPB. Its use is also very easy that just by submitting photos boarding facility damage without having to part R ome T angga hostel. According to a woman born in Bogor, April 4, 1979, his superiority over the other participants are innovations that brought already done four years coupled with new innovations that will be launched. In addition, the process of calculating the amount of the deposit, and how proper reporting system is also a Heni advantages compared with other participants. Heni have entered the financial manager in 2012 and was awarded as the financial manager IPB achievement II level in 2017 and achieved the first level as well IPB's National in 2018.